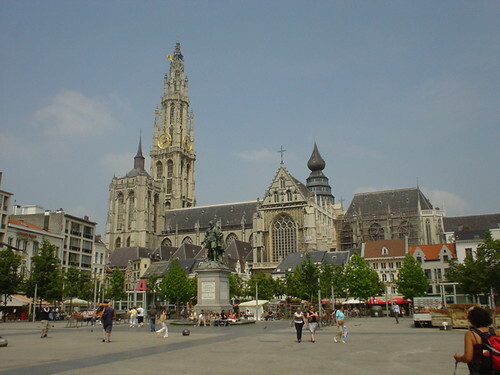 Antwerp is by many accounts the most popular travel destination in Belgium, alongside smaller towns like Ghent and Bruges. It’s a stop on the high speed rail line between Paris, Brussels and Amsterdam, so getting there is pretty easy, even if you fly into an alternative airport and catch the train. So what’s there to see and do? One of the big highlights of Antwerp is the famed diamond district, where you can supposedly buy a diamond for a special someone on the cheap. This is probably the last reason I’d come here – with lots of shady shops, conflicting information on how to avoid being scammed, and a lot of fraud, save your money for the brew pubs. In Antwerp’s defence there are plenty of legitimate retailers, but you won’t be getting a diamond deal unless you do your homework in advance. Instead, do your homework here by exploring the city’s numerous chip shops and breweries. Some of the best beers in the world are brewed in the countryside around Antwerp, and you’ll find plenty of them to enjoy. Any pub will do, but if you’re interested in the whole brewery experience, check out the Huisbrouwerij ‘t Pakhuis. Inexpensive but tasty dining is also easy to find in Antwerp. Yes, yes – all of those lovely terraces out in front of the historic buildings look nice, but you can do better. Seek out one of my favourite restaurants, In de Gloria, for cheap and filling food. 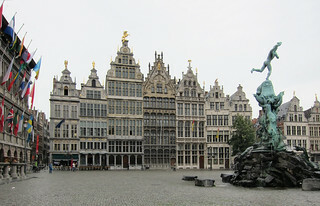 Part of the charm of Antwerp is exploring the city on foot – though sadly the area’s reputation for poor weather is well-reserved, so be sure to pack a raincoat or dress in layers – honestly, it doesn’t rain all day every day. But make an effort to explore the river front area, as well as poke around in some of the alleyways behind those historic and picturesque buildings – it makes for some great photo opportunities and you might find some interesting sights. 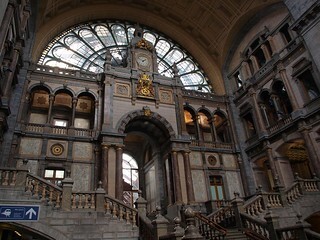 And what about Antwerp’s museums? The city is where many of Belgium’s famous painters and artisans were born, and the city was very, very wealthy in previous centuries, but despite this I think the range of museums is somewhat limited. If you want an eye-opener, check out the Museum of Modern Art – like a similar modern art museum in Ghent, the rotating galleries on display here range from the macabre to borderline perversion. That makes it sound like a bad thing, but I appreciate the open mind the curators have in bringing multimedia exhibits that really do paint a vivid picture of life. I also always recommend a stop into the much more subdued but nonetheless impressive, Onze Lieve Vrouwekathedraal. This is one of the largest cathedrals in Europe – you can see it when flying in or when arriving at the train station. Why I recommend it is because it has many of the city’s best art – so you get a two-for-one deal here. Skip the rest of the museums and enjoy the rest of your free time on a terrace – perhaps you’ll find a sunny spot to relax the afternoon away.